Frank Underwood is officially dead, a trailer for the sixth and final series of House of Cards has revealed. The Netflix trailer shows Robin Wright, who plays Spacey's screen wife Claire, speaking at Frank's grave. "I'll tell you this though, Francis. When they bury me, it won't be in my backyard. When they pay their respects, they'll have to wait in line." Spacey was dropped from the show following sexual assault allegations, which he denies. Last year, Spacey was accused by actor Anthony Rapp of trying to seduce him in 1986 when Rapp was 14. Spacey claimed to have no memory of the events but publicly apologised. He has since issued an "absolute" denial of the other allegations that later emerged. On Wednesday, it was announced that Spacey will not be prosecuted over an accusation of sexual assault that allegedly took place in 1992. Officials confirmed in April that an allegation involving Spacey and an incident with a man in West Hollywood in 1992 was being investigated. Image caption Robin Wright said: "Every human being has the ability to reform." 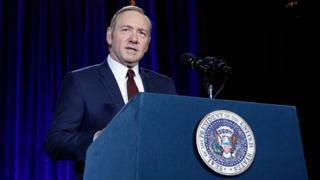 The final season of House of Cards will drop on Netflix on 2 November with eight episodes rather than the usual 13. In an interview with Net-A-Porter's digital magazine, Wright said the show came "very, very close" to being cancelled after its fifth season, "because of the climate at that time". "The air was thick, you know. Harvey Weinstein... People were [saying], 'We have to shut everything down or otherwise it will look like we are glorifying and honouring this thing that's dirty'," she said. Wright said the political thriller itself "is not dirty" and that she believed it should be finished for the "people that loved the show". She said it would not have been fair on all the people who worked on the show if it had been cancelled. Asked if she thinks Spacey deserves a career reprieve, she said: "I don't know how to comment on that, I really don't... I believe every human being has the ability to reform. "In that sense, second chances, or whatever you are going to call it - absolutely, I believe in that. It's called growth."